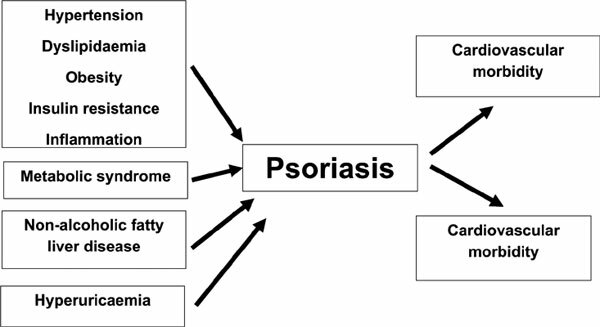 Psoriasis (Pso) is a chronic inflammatory immune-mediated skin disease associated with several comorbidities. Despite the growing number of studies providing evidence for the link between Pso and Cardiovascular (CV) disorders, there are still many unsolved questions, dealing with the role of the skin disease as an independent risk factor for CV events, the influence of Pso severity and duration on CV damage, the presence of Psoriatic Arthritis (PsA) as a predictor of increased CV mortality and morbidity and the detection of reliable clinical, laboratory and/or instrumental parameters to stratify CV risk in psoriatic patients. Moreover, it remains to clarify if the early treatment of the dermatosis may lower CV risk. In this paper we will try to provide answers to these queries in the light of the updated data of the literature. Keywords: Psoriasis, cardiovascular risk, risk factors, coronary artery disease, metabolic syndrome, myocardial infarction. Keywords:Psoriasis, cardiovascular risk, risk factors, coronary artery disease, metabolic syndrome, myocardial infarction. Abstract:Psoriasis (Pso) is a chronic inflammatory immune-mediated skin disease associated with several comorbidities. Despite the growing number of studies providing evidence for the link between Pso and Cardiovascular (CV) disorders, there are still many unsolved questions, dealing with the role of the skin disease as an independent risk factor for CV events, the influence of Pso severity and duration on CV damage, the presence of Psoriatic Arthritis (PsA) as a predictor of increased CV mortality and morbidity and the detection of reliable clinical, laboratory and/or instrumental parameters to stratify CV risk in psoriatic patients. Moreover, it remains to clarify if the early treatment of the dermatosis may lower CV risk. In this paper we will try to provide answers to these queries in the light of the updated data of the literature.